On a per-team basis, Canada West is best at providing a pipeline to the CFL. Last year this time, Duane Rollins provided a complete list of Canadian-trained players on CFL rosters. It provides a thumbnail sketch about how Canadian Interuniversity Sport players are faring in the pros. It's timely, with alumni such as Andy Fantuz (Western, pictured near right) becoming an impact receiver for the Saskatchewan Roughriders and likes of UBC grad Shea Emry (right photo) getting a start at middle linebacker tonight for the Montréal Alouettes. By our count, there are 111 CIS players either on an active roster or the nine-game injured list. By team — Saskatchewan Roughriders 21, Winnipeg Blue Bombers 17, Toronto Argonauts 17, Hamilton Tiger-Cats 14, Edmonton Eskimos 13, Montréal Alouettes 11, Calgary Stampeders 9, B.C. Lions 9. By CIS conference — Canada West 41 (5.9 per team), OUA 41 (4.1), Québec 18 (3), Atlantic 11 (2.8). Offence — Jason Clermont, SB, Regina; Andy Fantuz, WR, Western; Chris Getzlaf, SB, Regina; Rob Bagg, WR, Queen's; Adam Nicolson, WR, Ottawa; Dave McKoy, WR, Guelph (injured); Neal Hughes, FB, Regina; Gene Makowsky, G, Saskatchewan; Chris Best, G, Waterloo, Nick Hutchins, OL, Regina; Jordan Rempel, OL, Saskatchewan. Defence — Kevin Scott, DT, Queen's; Sasha Glavic, LB, Windsor; Mike McCullough, LB, St. FX; Tamon George, CB, Regina; Jeff Zelinski, DB, Saint Mary's; Sebastian Clovis, DB, Saint Mary's; Leron Mitchell, DB, Western (injured). Offence — Daryl Stephenson, RB, Windsor; Arjei Franklin, SB, Windsor; Aaron Hargreaves, WR, SFU; Ibrahim Khan, OL, SFU; Kelly Bates, G, Saskatchewan; Ryan Donnelly, OL, McMaster; Brendon LaBatte, OL, Regina; Steve Morley, OL, Saint Mary's; Lorne Plante, C, Manitoba. Defence — Doug Brown, DT, SFU; Don Oramasionwu, DT, Manitoba; Pierre-Luc Labbé, LB, Sherbrooke; Brady Browne, DB, Manitoba; Steven Holness, DB, Ottawa; Ian Logan, S, Laurier. Specialist — Chris Cvetkovic, LS, Concordia; Mike Renaud, P, Concordia. Offence — Bryan Crawford, RB, Queen's; André Durie, RB, York; Jeff Johnson, FB-RB, York (injured); Mike Bradwell, SB, McMaster; Tyler Scott, WR, Western; Brad Smith, WR, Queen's; Andre Talbot, WR, Laurier (injured); Dominic Picard, C, Laval; Jeff Keeping, G, Western; Mark Dewit, G, Calgary. 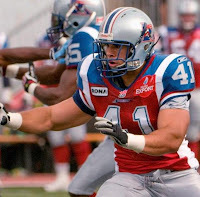 Randy Srochenski, LB, Regina; Jason Pottinger, LB, McMaster; Jean-Nicolas Carrière, LB, McGill (injured); Delroy Clarke, CB, Ottawa (injured); James Green, S, Calgary. Offence — Simeon Rottier, OL, Alberta; Alexandre Gauthier, OL, Laval; Chris Bauman, WR, Regina; Dave Stala, WR-K, Saint Mary's; Darcy Brown, FB, Saint Mary's; Andre Sadeghian, RB, McMaster. Defence — Matt Kirk, DT, Queen's; Agustin Barrenchea, LB, Calgary; Ray Mariuz, LB, McMaster; Yannick Carter, LB, Laurier; Dylan Barker, DB, Saskatchewan; Marc Beswick, DB, Saint Mary's; Sandy Beveridge, DB, UBC. Specialist — Matt Robichaud, LS, Bishop's. Offence — Jesse Lumsden, RB, McMaster; Chris Ciezki, RB, UBC; Mathieu Bertrand, FB, Laval; Graeme Bell, FB, Saskatchewan; John Comiskey, C, Windsor; Kyle Koch, OL, McMaster; Gordon Hinse, OL, Alberta. Defence — Dee Sterling, tackle, Queen's; Justin Cooper, DE, Manitoba; Tim St. Pierre, LB, Saint Mary's, Elliott Richardson, DB, Acadia; Scott Gordon, DB, Ottawa. Specialist — Derek Schiavone, K-P, Western (injured). Offence — Luc Brodeur-Jourdain, C, Laval; Scott Flory, G, Saskatchewan; Mike Giffin, FB, Queen's; Dylan Steenbergen, T, Calgary (injured). Defence — Jeff Robertshaw, DE, McMaster; Shea Emry, LB, UBC; Joel Wright, LB, Laurier; Cory Huclack, LB, Manitoba (injured); Mathieu Proulx, S, Laval; Doug Goldsby, S, UBC; Paul Woldu, CB, Saskatchewan. Offence — Greg Hetherington, SB, McGill; Angus Reid, C, SFU; Dean Valli, G, SFU; Andrew Jones, OL, McMaster. Defence — Ricky Foley, DE, York; Javy Glatt, LB, UBC; James Yurichuk, LB, Bishop's; Jason Arakgi, S, McMaster. Specialist — Dan McCullough, LS, Bishop's. 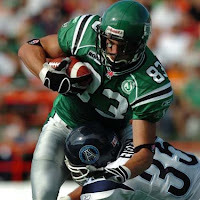 Offence — Brett Ralph, WR, Alberta; Godfrey Ellis, G, Acadia; Tim O'Neill, C, Calgary; Derek Armstrong, G, St. FX (injured). Defence — Miguel Robede, DT, Laval; Justin Phillips, DE, Laurier; Wes Lysack, DB, Manitoba. Specialist — Burke Dales, P, Concordia; Randy Chevrier, LS, McGill. For point of comparison, there are numbers available which count practice-squad players. This list counts players on the active roster and nine-game injured list. I think another interesting breakdown would be starters by school in the opening week. Without singling out particular players, there are many on the above list who are simply cannon fodder for special teams, if that. Great suggestion, thank you so much. We should do that on Friday after the last game of the week (which will be Saskatchewan 26, B.C. 17). Note: the regrettable Chris Bauman is not long for the world of professional football. What a bust. The Cats started using Dave Stala last night as their 5th receiver. I am shocked — shocked! — the Tiger-Cats would make a mistake in talent evaluation. Bauman caught a couple balls last night during the window-dressing stage of the game. The two Argos' backs and receivers with Hamilton ties had nice nights. Bryan Crawford made some good gains, while Mike Bradwell showed some promise.